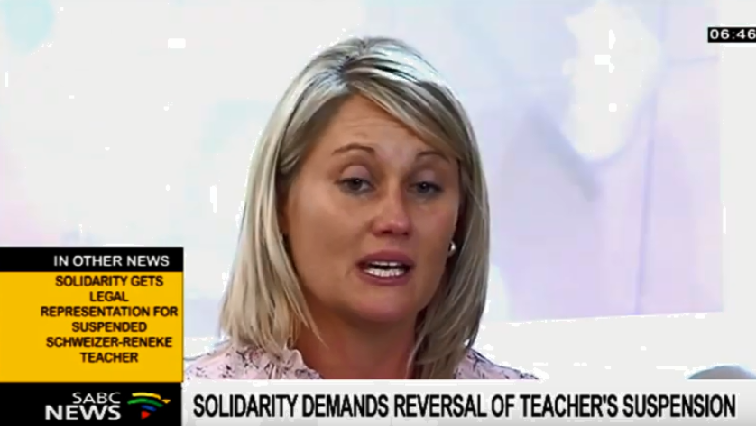 Laerskool Schweizer-Reneke teacher's suspension lifted - SABC News - Breaking news, special reports, world, business, sport coverage of all South African current events. Africa's news leader. Elana Barkhuizen took a photo of white and black Grade R learners seated separately in a classroom. The suspension of a teacher at Laerskool Schweizer-Reneke in the North West has been lifted. Elana Barkhuizen was suspended last Thursday after taking a photo of white Grade R learners seated separately from their black classmates. Education MEC Sello Lehari is heading a team of officials to a meeting with school management. The meeting comes after trade union Solidarity announced its intention to legally challenge the suspension of Elana Barkhuizen. Lehari will brief the media after the meeting. This entry was posted on 16 Jan 2019,11:37AM at 11:37 AM and is filed under South Africa, Homepage Latest Stories Slider. You can follow any responses to this entry through the RSS 2.0 feed. Both comments and pings are currently closed.